Full Form of BRICS is "Brazil Russia India China and South Africa". BRICS consists of five countries. BRICS Nations established a BRICS development Bank in 2013. 1st BRIC Summit held in June 2009 Yekaterinburg, Russia. 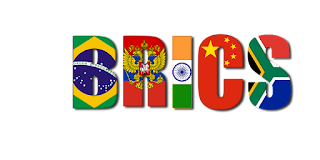 South Africa joined in 2010 in BRIC so From 2010 BRIC is called as the BRICS. ➥Theme of the BRICS summit 2018: Bricks in Africa: Collaboration for inclusive growth and shared prosperity in the 4th industrial revolution.